Bring vivid color to your yard while helping birds thrive with the Heartwood Green Apple Fruit Coop Bird House. The bright green finish on this home immediately captures attention, and the tall, angled roof adds contrast to the piece. Cypress wood shakes on the roof further the rustic look, and also overhang the 1.125" diameter entry hole to keep water out of the roost. This diminutive and lovely home is specifically designed for wrens and chickadees, and its flat back and attached hardware enable mounting onto a post or wall in moments. A copper panel on the back of the piece allows for seasonal cleanouts, and a drainage slot on the base helps the nest remain dry. 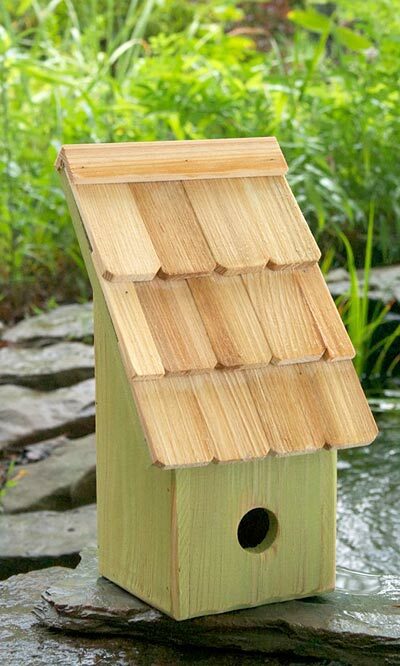 The durable cypress body protects nestlings from the elements, and will look great and remain functional for several seasons. Its remarkable green hue evokes Granny Smith apples, lending a fresh and whimsical hint to your yard all year. Invite birds to roost in a fun space with this Green Apple Fruit Coop Bird House. Made in the USA. Woodlink Post Mount Squirrel Baffle, Green, 22" dia.